What is more fun then running through puddles, mud and snow? Running through them in these kids rain boots that have Olaf the snowman from the Frozen movie on it. These are light blue rain boots with dark blue soles and handles to make it easy for kids to wear them. 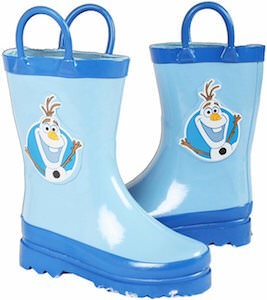 You can get these Frozen rain boots in toddler sizes 3 – 8. The Olaf rain boots are made from 100% rubber with a cotton / polyester blend lining. Just imagine you child’s face when you surprise them with these cute and useful rain boots with everyones favorite snowman Olaf on it.